Home > FRS batteries > FRS-009-NH : 3.6 volt 1650mAh Ni-MH battery for Motorola FRS radios. FRS-009-NH : 3.6 volt 1650mAh Ni-MH battery for Motorola FRS radios. 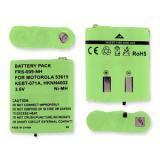 FRS-009-NH: 3.6 volt 1650mAh rechargeable Ni-MH battery pack for Motorola FRS radios. Replaces original part #s 53615, HKNN4002, HKNN4002A, KEBT-071, KEBT-071-C, KEBT-071-A, KEBT-071-B, KEBT-071-D, 4002A, EM1020R, FRS-4002A, KEBT-1300, KEBT-650, MJ430R, MR560R, T6510, etc. Fits radios such as EM1000R, FV500, FV600, FV800, HKNN4002, KEBT071, KEBT-071, MJ270R, T4800, T4900, T5000, T5320, T5400, T5410, T5420, T5500, T5522, T5600, T5620, T5700, T5710, T5720, T5800, T5820, T5900, T5920, T6000, T6500, T6500R, T8500, T9500.